We want to get to know you and better understand your needs, and that means a thorough look at the health of your gums and teeth. In the event that your dental treatment requires specialty services, Great Expressions offers in-house specialty services at many of our dental care centers. 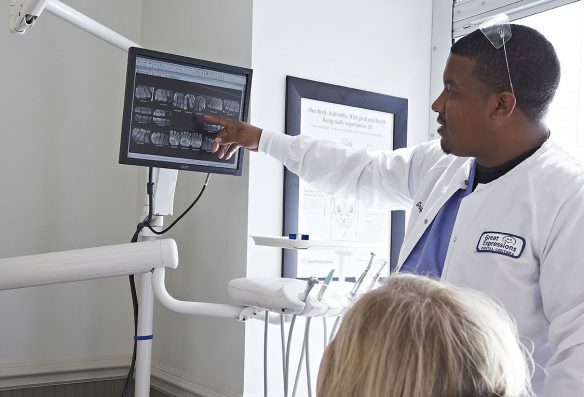 Our doctors work as a team with your general dentist to develop a personalized dental treatment plan that will help you Be Your Own Kind of Great for years to come. Please arrive 10 to 15 minutes early to fill out your remaining patient forms. If you have a medical condition which requires premedication, please request a prescription prior to your appointment, or if you are unsure, please contact your office. Your teeth cleaning may be performed at your first visit or might be scheduled for a follow-up visit depending on the condition of your teeth and gums. We will make every effort to complete your cleaning right away. If necessary, our patient coordinator will discuss and assist you with insurance and maximizing your benefits or financing options, including CareCredit or our Smile Protection Plan. Our team members work with you on payment arrangements, so cost is never a deterrent to doing what is best for you or your family.